NOT since the dotcom boom at the turn of the century have technology shares been on such a tear. On July 19th the S&P 500 index of information-technology stocks hit a record high, closing above its previous peak in March 2000. As titans like Google, Facebook and Amazon hog the limelight, other firms can go unnoticed. One that deserves more attention is Priceline, the world’s largest online-travel company. Those old enough to remember the dotcom boom may still associate Priceline, which was founded in 1997, with its “name your own price” feature, which let consumers bid for hotel rooms and flights. Today it is a Goliath. Its stable of online sites for booking hotels, cars, flights and restaurants spans the world and includes Booking.com, Kayak, Agoda and OpenTable. 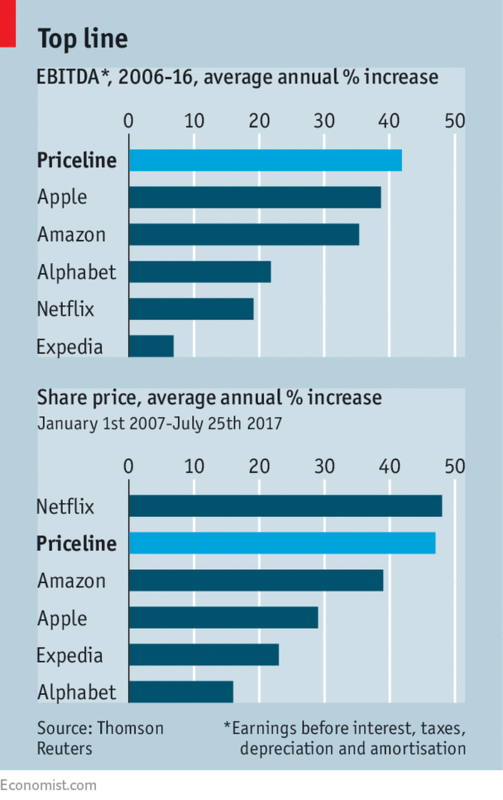 Over the past decade Priceline’s pre-tax earnings have grown at a compound annual rate of 42%, faster than Apple, Amazon, Netflix and Alphabet (see chart). It also boasts a 96% gross margin. Its share price has risen by more than 50% over the past 12 months, about four times faster than the broader stockmarket. On July 26th the firm’s market value rose above $100bn. The most important reason for Priceline’s success is shrewd dealmaking. In 2005 it paid around $135m to buy Booking.com, a Dutch website that aggregates hotel inventory, and merged it with another acquisition, a British travel site called Active Hotels. Today Booking.com has the world’s largest supply of hotel accommodation and accounts for the lion’s share of Priceline’s revenue and market value. Booking.com was one of the best deals “in the history of the internet”, says Mark Mahaney of RBC Capital, an investment bank. Priceline’s focus on accommodation helps explain why it is more profitable and more highly valued than Expedia, a rival online-travel company that operates sites such as Orbitz, Travelocity, Trivago and Hotels.com. Expedia does more business booking flights, but these are not as lucrative. Online-travel firms take a meaty commission of 15-18% of a hotel room’s price, compared with a slim 3-4% for airfares, according to Brian Nowak of Morgan Stanley, another investment bank. Unlike Google and Amazon, Priceline does not aim to be on the cutting edge of technology, but it does make clever use of it. Booking.com excels at bidding for online-search keywords. It is rumoured to be the world’s top spender on Google: last year it spent $3.5bn on “performance marketing”, which is mostly related to search advertising. Booking.com is also constantly trying new features: it runs around 1,000 tests a day to see what makes users more likely to click “book”. Some of these experiments, such as free cancellations and ranking hotels by the strength of their Wi-Fi, have become permanent features. Steady management has helped the company, too. Glenn Fogel became Priceline’s boss in January, after the previous boss, Darren Huston, resigned for having an affair with an employee. But Mr Fogel, a former investment banker and trader, has worked at Priceline for 16 years and is credited with initiating the Booking.com deal. Asked about his firm’s success, he attributes some of it to letting acquired firms go about their business. Kayak, an aggregator of travel listings that Priceline purchased for $1.8bn in 2012, for instance, still retains separate headquarters in Connecticut, six miles away from Priceline. And then there are the lessons of the firm’s own history. One is not to try too many things at once. During the dotcom boom the firm took the “name your own price” concept to extremes, allowing people to bid on petrol, groceries and even mortgages. The ensuing bust was bleak: Priceline’s market value dropped by more than 99%, to $190m (the share price is up by 30,000% since that trough). That experience taught management to prize discipline and profitability. The corporate ethos today is one of a “workhorse, not show-pony”, says one person close to the firm. If analysts have their numbers right, the future looks bright for Priceline. Last year travel accounted for an estimated 10% of global GDP, or $7.6trn. But only around a third of that is booked online. This share is expected to rise by a couple of percentage points a year over time, about the same pace as e-commerce more broadly. And as people become wealthier, they tend to travel more; many in emerging markets are venturing abroad for the first time. New markets beckon, too. The concept of “alternative accommodation”—rentals of apartments, villas and homes—was popularised by such firms as Airbnb, HomeAway and VRBO (the last two are both now owned by Expedia). But Priceline is bulking up in this area: last year it offered 568,000 “alternative accommodation” listings on Booking.com, nearly 50% more than a year earlier. Airbnb lists 3m, but many of those are individual rooms for rent in a larger home, whereas Priceline mostly offers entire properties, many of them professionally managed. Mr Fogel argues that Priceline’s approach of offering both hotels and other accommodation makes sense, because people like having a variety of choices available in one place. But Priceline will increasingly compete with Airbnb, which is expected to go public next year and is hungry for growth. Airbnb is said to have plans to add more listings of boutique hotels and bed-and-breakfasts to its own service and has suggested it could offer flights, although it has not offered any details. Priceline and Airbnb will also compete over more of consumers’ budgets when they travel. Earlier this year Airbnb started selling local “experiences” with guides. Booking.com is experimenting with selling tours and other on-the-ground activities in several cities. The idea is to offer a “holistic system” for travel, says Mr Fogel, so people can use the Booking.com app to check into hotels without queuing, enter their room by swiping their phone as they do to board an airline, and make dinner reservations through OpenTable. Such features are meant not only to increase the company’s share of consumer spending, but also to ensure that customers continue to book on Priceline’s sites rather than directly with hotels and restaurants. But becoming a one-stop-shop for all travel needs won’t be easy. Priceline’s least successful acquisition was OpenTable, for which it spent $2.6bn in 2014. Last year Priceline wrote down around a third of its value, acknowledging that the restaurant-booking service was not expanding as quickly as had been expected. This suggests that consumers may be comfortable using all-purpose sites to book hotels and flights, but still want to use real-life concierges for local recommendations. Airbnb is not the only rival Priceline has to worry about. Technology firms will launch more pointed attacks. Google already offers consumers the ability to research flights and routes, directly taking on Priceline’s Kayak. The search giant can use its vast trove of data on consumers to push more deeply into the travel business. The most dangerous rival, however, may well come from somewhere else entirely. “We’re all waiting for the moment when a big Chinese company comes in and tries to take market share,” says Erik Blachford, a former boss of Expedia. Ctrip, a giant based in Shanghai and worth an estimated $30bn, is the obvious candidate. But if it indeed makes a move, Priceline will not necessarily suffer. Not only is its Chinese business growing nicely, but it has also invested nearly $2bn in Ctrip’s debt and equity. Small wonder that some analysts consider Priceline the best-run internet company after Amazon.